With the varied palates in our household, I've given up on the notion of making everyone happy at every meal. When we entertain other families, though, I like the meal to please our guests as well as my family, so that everyone can have an enjoyable evening. One of my tricks to accomplish this is to serve a relatively basic dish that is served with several condiments. That way, everyone can make it to their liking. This recipe, which I got from my Mom, fits the bill. 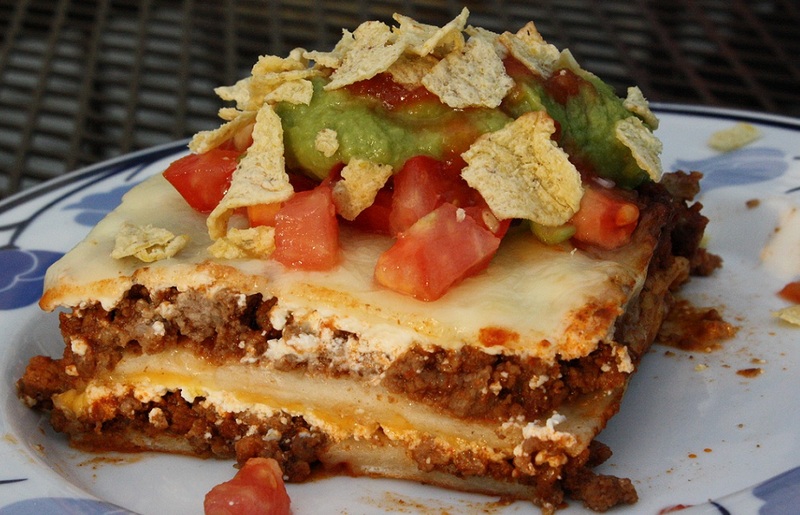 It's the familiar ingredients you'd find in Americanized tacos, but layered in a lasagna-style casserole and served with various condiments. The last time I served it, everyone -- parents and kids alike -- cleaned their plate. (Which, by the way, is the reason for the lousy quality of this picture -- I only had time to get off a shot or two, and didn't bother gussying up the plate.) I made the casserole, popped it in the oven as my guests arrived, and I was able to enjoy my guests instead of fussing in the kitchen. It was a fun evening for everyone -- even the cook! Mission accomplished. Condiments: I usually use salsa, chopped tomatoes, guacamole, crushed tortilla chips and green onions, but you could use other Mexican-type ingredients like cilantro, pico de gallo, jalapenos, black olives, jicama, etc. Brown meat and drain. Add taco sauce and simmer 10 minutes. In a 13" by 9" pan, layer half of the tortillas, half of the meat mixture, half of the sour cream and half of the cheese. Repeat. Bake at 350 degrees for 50 minutes. Serve with condiments. Casserole can be made ahead and reheated. It also freezes well. Mexican casserole of any kind goes over big with eveyone in our household including my sixteen year old who doesn't like anything but chocolate milk and bacon wrapped hot dogs. This looks great. Oh, does this look good! I'll have to try it with my own little crowd at home soon. This also gave me an idea I'd love to share with you about a possible product review/giveaway for you and your readers. Do you have an email I could send information to? You can contact me at sarah@lemkeanderson.com.